James the author of this letter is one of the most prominent figures in the early church, known as “the brother of the Lord” and the leader of the church in Jerusalem. Despite these credentials James with great humility calls himself “a slave of God.” James begins his letter with a message that seems hard to accept. When we encounter trials, we should consider it joy. James is not saying because we are suffering we should be happy. Rather, since he knows that faith is very important for the follower of Jesus, trials are test that strengthen our faith. Faith is more than believing in God, it means a life lived in fidelity, commitment and truth, it is an interior commitment to God that is expressed in concrete behavior. 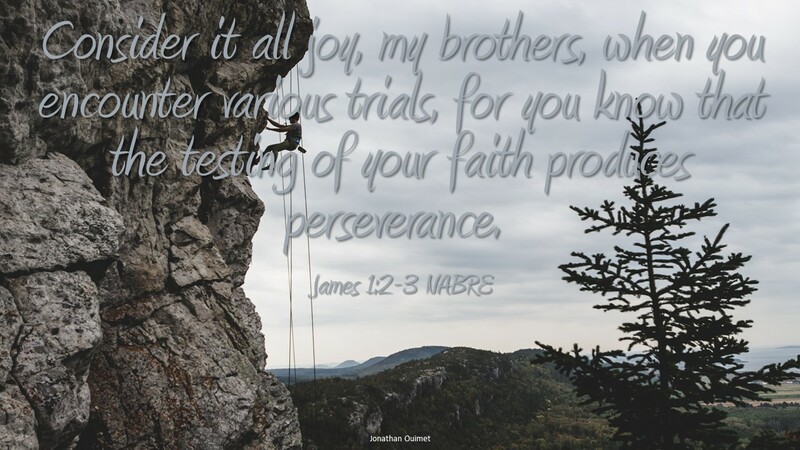 James is considering trials as test of faith that through perseverance produces strengthened faith. Consider an exercise program, it challenges you but builds a stronger, healthier body. The same for anything that strengthens our faith, it is considered positive, even suffering and trials. James does not consider the trials the cause for joy, but their fruit. We do this by persevering, remaining firm, staying the course as a follower of Jesus in trials. James says testing produces perseverance which makes for perfection. Working our spiritual muscles strengthens our interior conviction as a member of Jesus church. We can go without something and donate it for the poor, provide service to help the needy, challenge ourselves to live more perfect lives; all helping us for those times when true trials come. Exercising with a joyful attitude creates perfecting followers. What struggle in your life are you currently enduring? Can you convert a struggle to a joy filled test?